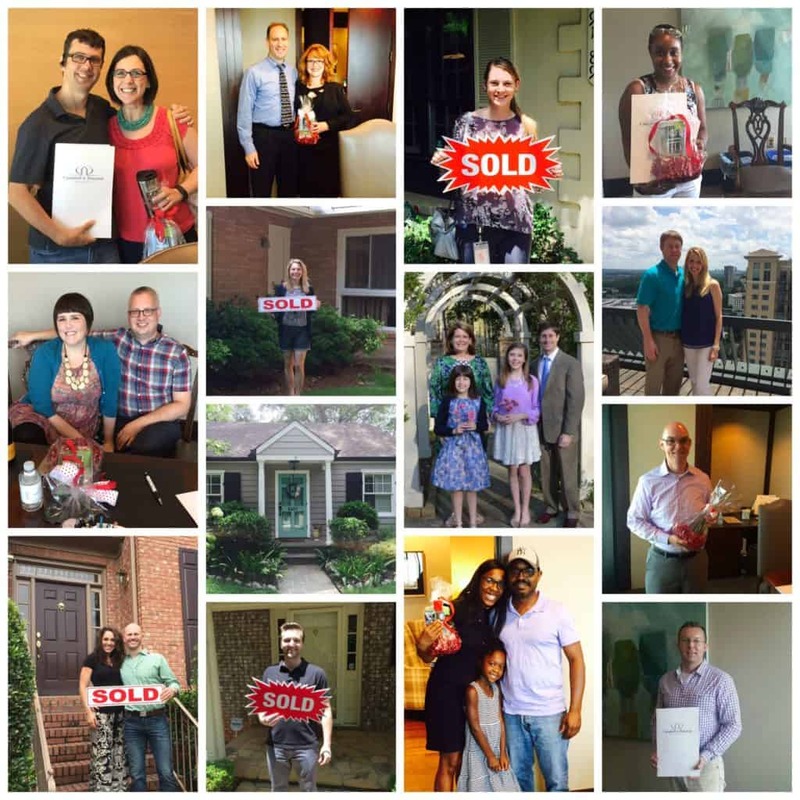 Congrats to The Peters Company June Metro Atlanta Homebuyers! Congratulations to our June Homebuyers! Congrats, Crystal on purchasing your very first home in Buford! Your gorgeous new townhouse in Carlton Mill will be the perfect place to settle in from your move from Tennessee! You’re going to love the walkability to shops and restaurants, and being across from the neighborhood pool! Now that you have your house, we know a puppy is next on the list! Thanks for trusting our team! Welcome to Georgia! Nick and Jane, congratulations on purchasing your adorable Peachtree Hills bungalow! Even though you were in Paris when your house closed, we hope that you felt the happiness all the way from Atlanta! Your move has been over 6 months in the making, and while we know that Nashville will miss you, we’re thrilled for you to call Atlanta your new home! Thanks for sticking with us through a competitive market! You were troopers, and being the winning bid for this home was truly meant to be! Welcome to Atlanta! Congratulations, Bill and Crista on purchasing your super trendy Midtown townhome! We know that moving (back) to the South from Chicago is a big change, but you’re going to LOVE your location and walking to Piedmont Park! While there are probably too many inside jokes to mention, please know that Jennie LOVED working with you, and despite the ups and downs, everything worked out just as it should for you guys and Iris! Also, a big shout out to Bill’s folks, Jim and Susan, for sending you our way! We’re sure they are glad to have their granddaughter nearby! Congrats, again! Daniel and Victoria, congrats on your beautiful home in the fantastic Peachtree Corners neighborhood, Amberfield! When the time came to sell and buy, we knew that all of the pieces needed to fall together perfectly, and in the end they did! We may recruit Victoria to our team as a showing assistant, as she was one of funniest people to looks at houses with! We know that Titus is going to love his new home, yard, pool and neighborhood, and we hope that you have many wonderful years there too! Thanks for being great clients and friends! Shout out to Joey and Rebecca for referring us! Erica and David, you knew exactly what you wanted – a new home in the same neighborhood you were currently living in, Meadowbrook, and in High Point Elementary School. You found a great new construction home with plenty of space for your 3 children and a huge finished basement that David can call his own. Thank you for trusting The Peters Company to list and buy your homes! Nothing like repeat clients! Congratulations on your new home! Congratulations, Jules on the purchase of your gorgeous mid-century modern home in North DeKalb’s Flair Forest! Finding this rare and stylized home (on a lake!) in the middle of the city was truly incredible. Fun fact :: you may be the only client to buy a home that all three of the buyers specialists have seen! You got the FULL Peters Company experience! We are all envious of your serene views of the lake, and know you will have many years of happiness in your new home. Thanks for trusting in our team. You’re the best! Dennis and Melanie, we found the ideal location for your family! Walking distance to everything around GA Tech in a lush, gated community! I’m glad you went for move-in ready and ran away from the duplexes and triplexes! So happy we found this hidden gem I know all of you will enjoy, especially that pool! Thank you for trusting The Peters Company for your 3rd transaction with us! Congratulations, Tobias on your first home purchase in the sleek Spire building in the heart of Midtown! After looking at many styles of condos and buildings we found the perfect match for you here. I can’t wait to see the “after” photos once you and your designer decorate and paint this blank canvas. I know you are going to enjoy the walkable location! Thank you for letting me help you find your first home so you can stay put for a while in Atlanta! Shout out to your sister, Elisa, for referring us! Congrats Haley! You weren’t 100% sure what would be the best fit when we started out, but we found a great 2 bedroom condo in Buckhead that is gated and safe. The amenities are awesome and you will enjoy the great location near the West Side. You started renovations the day you closed and will make it a super place to live! Can’t wait to see when you get settled! Chrystal and Tonio, you knew where you wanted to be and what school district you wanted to be in for adorable Sydney. We found a great, renovated home in Roswell with room for both of you to have home offices, a fenced in yard for your dog (and maybe another!) and chickens! And Tonio, there is plenty of space for you to add that outdoor kitchen and patio you wanted. Congrats y’all – Thank you for letting me help you find a super place! Shout out to Lisa for referring us! Bryan, buying your first home can be a stressful experience, but you handled it like a pro! I have to say, you were one of the easiest clients I have dealt with in 13 years of selling real estate. It is great that your new house in Marietta close to your office, restaurants and shopping and across the street from friends. Especially friends who will help you renovate the fixer upper. Congrats on your new home! Wow! Karl and Christina, you bought a house an hour from our original search area, and it is beautiful! I know you will love living in the peaceful serenity of Sharpsburg. And Christina, you will enjoy being in the same neighborhood as your parents. Invite us over when the pool is finished – congratulations! Congratulations, Kristen and Alex on finding your dream home in an amazing neighborhood! Sarah Smith is a fabulous school district and we know that Loridans Chase is a great place to raise your babies! We can’t wait to see the transformation to your home as we know it will be fabulous. Jennie loved bonding over the kiddos and getting to know your whole family! Thanks for trusting our team! Congrats, Bill on the purchase of your great townhouse in Decatur! We won’t call you a “groupie,” but you have been a Peters Company client three times in the past three years! Jennie has LOVED getting to know you, and we are all so happy that you have finally found a place to call home for the long run! Selling and buying at the same time isn’t easy, but your trust in our team and willingness to be flexible ended up in a total win-win all around! Thanks again! Sally and Erik were referrals from our good friends, Shannon and Robby, and we were fortunate to work with them on the seller side as well as the buyer side. They really wanted to move closer to their children’s school in Sandy Springs. We were able to find an amazing off market sale for them that checked all the boxes! It was such a pleasure to help them achieve their goals! Did you know? According to the National Association of Realtors, the average real estate agent sells 7 homes per year. The Peters Company has sold 109 homes so far this year with 17 more under contract and set to close in the coming months. Don’t settle for average! Work with the best, and call us today.